Austin Matthews, (Above), got two goals and an assist last night. The Toronto Maple Leafs continue their hot streak despite already clinching a spot in the playoffs. 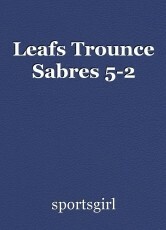 The Leafs defeated the Buffalo Sabres 5-2 last night. Austin Matthews had a good performance, scoring two goals and adding an assist. Andreas Johnsson put the Leafs ahead 1-0 at 5:44 of the first period. Just 2:27 into the second period, Sam Reinhart tied the game. At 5:01 of the second period, Matthews put the Leafs ahead 2-1. William Nylander scored back to back goals and put Toronto ahead 4-1. Matthews scored his second goal at 6:29 of the third period. Nylander finished the night with three points. Sabre's goalie, Chad Johnson stopped 31 shots. Toronto's goalie, Curtis McElhinney stopped 32 shots last night. The Leafs travel to New Jersey to play the Devils on Thursday night. This page was created in 0.6971 seconds.